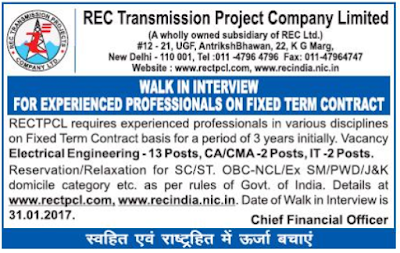 The applicants who are willing to apply for RECTPCL Recruitment 2017 they should should attend walkin interview on 31st January 2017. Entire information such as eligibility criteria, selection process, salary package, apply process, last date, etc. are mentioned on this page. Qualification Details: Aspirants should have attained Engineering Degree(Electrical) / CA / CMA from a recognized Board / University / Institute. Candidates who are meeting with the above detailed eligibility parameters must attend walkin interview on 31st January 2017. Walk In Date : 31-01-2017.